The results are in: Online accounts for 34% of global ad spend and is the fastest growing channel. And the German ad-tech market is growing fast. Our research projects that by 2022, there will be 4.66 billion internet users in the world and 56% will have two or more connected devices. 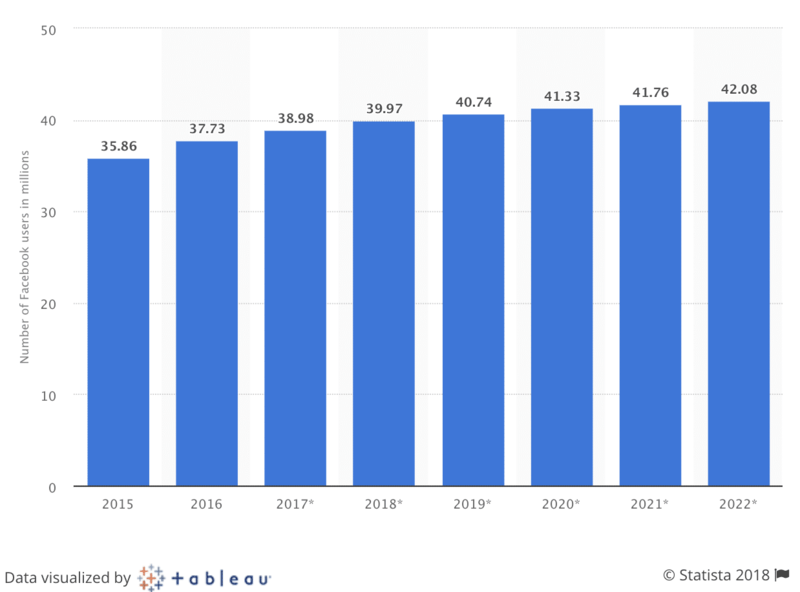 In Europe by 2022, here will be 441 million internet users and over 86% will have two or more connected devices. In Germany, online ad spend is the largest channel, accounting for 33% of total ad spend in 2017. How can marketers in Germany capture more of the growing digital ad spend opportunity? In Criteo’s recent State of Ad Tech EMEA report, we dive into exclusive findings from our work with Euromonitor on the survey, “Acquire, Convert, Re-engage.” We spoke with 150 marketers from around the globe about how they convert customers today — and what works best. 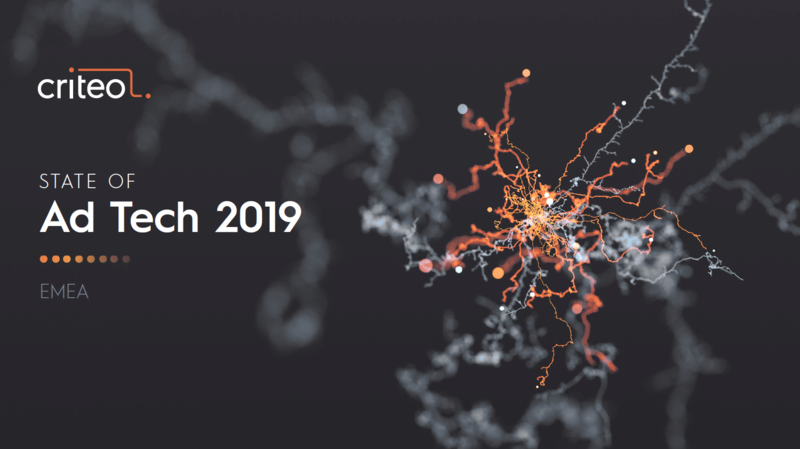 Insights include the top 2019 ad-tech trends, best strategies for re-engagement, most common metrics for measuring success, and more. In this post, we’ll cover just what makes the German ad-tech market tick. Statista research shows that about 77.3% of the German population (or 63.9 million people) were ecommerce shoppers in 2018 (+0.7% YoY). User penetration is expected to hit 79.9% by 2023. Germany’s largest ecommerce segment is Electronics & Media, with a market volume of over 22 billion USD (about 19 billion euros) in 2018. In a comparison of revenue, Germany ranks an impressive fifth place globally and second in Europe, behind China, the United States, the United Kingdom, and Japan. Revenue is expected to grow at an annual rate of 6.2% (CAGR 2018-2023), to over 95 billion USD by 2023. Germans are organized and efficient. 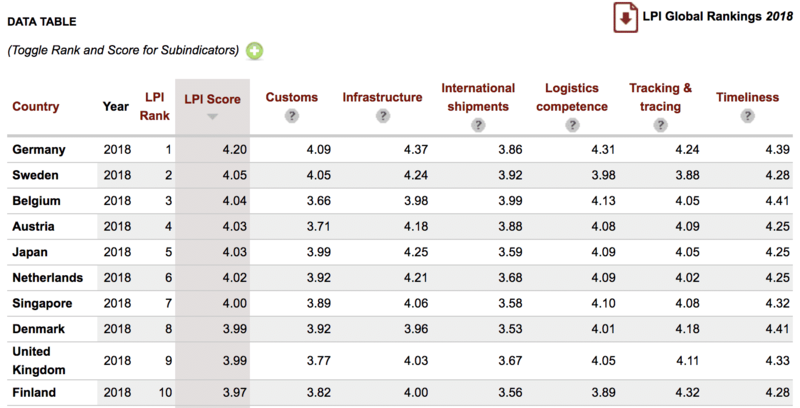 As far as infrastructure, Germany ranks first in the Logistical Performance Index. The country is also regarded as number one in “efficiency of customs clearance processes, quality of trade- and transport-related infrastructure and easier quality of logistics services”, writes the Ecommerce Foundation. According to Ecommerce News Europe, in 2018 a full 79% of online Germans can be called online shoppers — a higher share than ever before. Research also shows that 70% of German shoppers do some research online before making a major purchase. And they think product descriptions are the most important factor for deciding which online store to purchase from. Germans buy more books online, and they use fewer credit cards. According to the same research, shoppers in Germany enjoy buying books, movies, music, and games online (47%), followed by clothing (43%), and consumer electronics (41%). 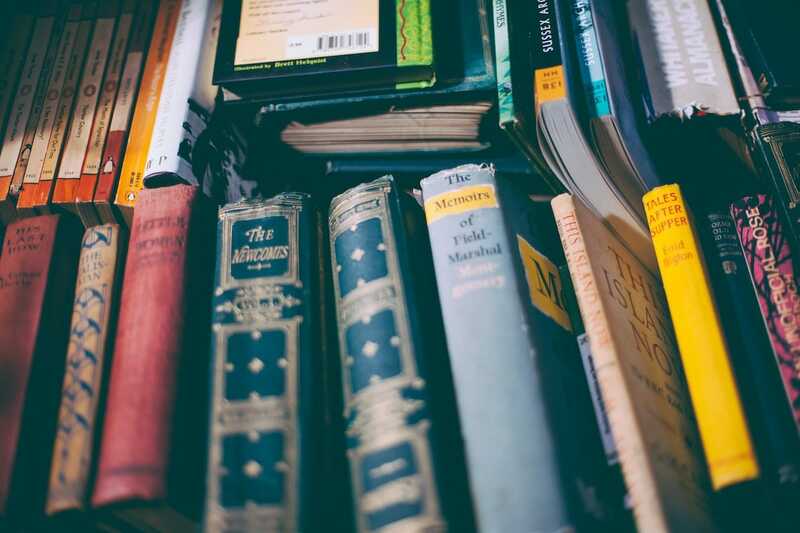 Books are most often purchased on mobile devices, with 61% of consumers saying they’d bought a book via mobile last year. When it comes to payment, credit cards rank number one for the method that Germans don’t use at all. A surprising 43% responded that they never use them. Another shopping trend: more foreign goods. In 2017, there was a 5% increase in consumers shopping online for products abroad. Today, one in four people who shop online purchase from abroad — mostly due lower prices and that they can’t find those products domestically. Facebook is Germany’s favorite social media network. Facebook is the most used social network in Germany. The number of overall social users in Germany is expected to hit 48.13 million in 2022. Comparing that overarching figure to the number of Facebook users shows just how much Facebook dominates. The average amount of time spent on Facebook is also significantly higher. Instagram has 9 million users in Germany, according to the platform. Twitter, outside of journalists and football clubs, never really caught on in Germany. YouTube does very well, commanding the highest media budgets along with Facebook in Germany. Mobile shopping is rising in Germany. Driven by an increase in smartphone transactions, mobile shopping continues to steal online retail sales share in Germany. 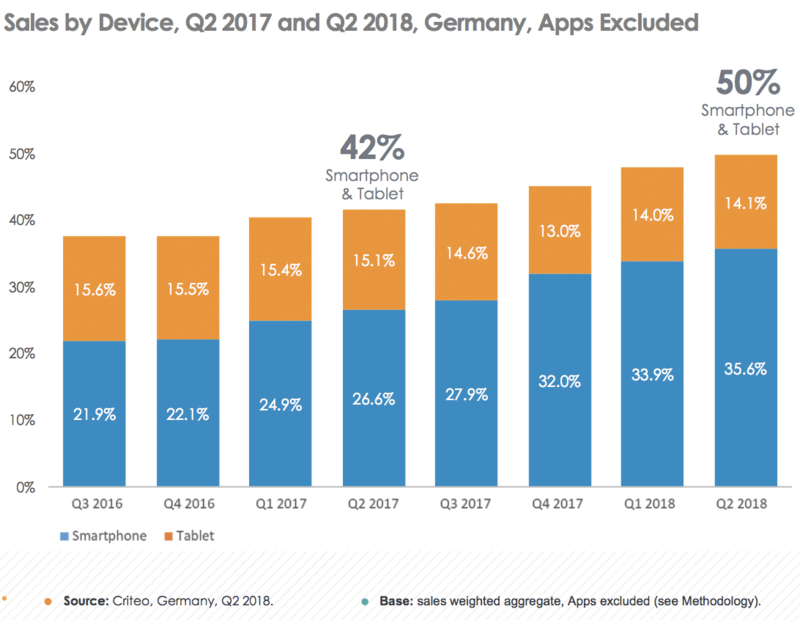 Criteo’s Global Commerce Review revealed that in Q2 2018, half (50%) of online retail sales in Germany happened on mobile — a +8% increase compared to Q2 2017. The State of Ad Tech Report: Ecommerce is thriving in Germany. As our State of Ad Tech report shows, today more than 3.5 billion people are regular Internet users. Around the globe, 40.2% of total ad spend is now going to digital. Research from Ecommerce Europe projects that the ecommerce market at large will grow to €602 billion by the end of 2018. Germany’s ecommerce market (€93 billion) is the third largest in the EU, just behind The United Kingdom (€178 billion) and France (€93.2 billion). 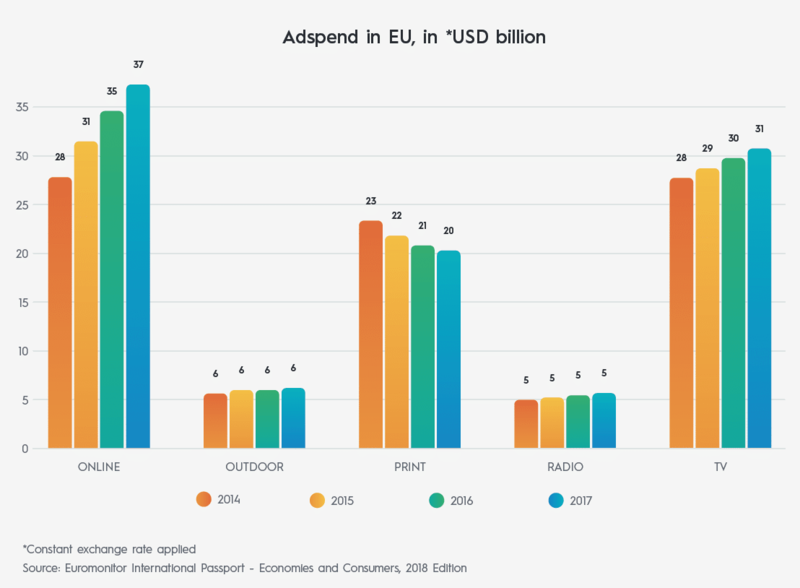 In step with the rise of ecommerce, overall ad spend in Europe is highest online, and has shown steady increases since 2014. TV also holds strong, but across the region, print is declining and outdoor and radio spend has stagnated. When it comes to tactics, EU marketers are spending heavily on paid display. Social media ad spend is increasing as well. Paid Display is a key focus for German marketers — 15% of ad budgets went to Paid Display Advertising, and another 14% to social media. 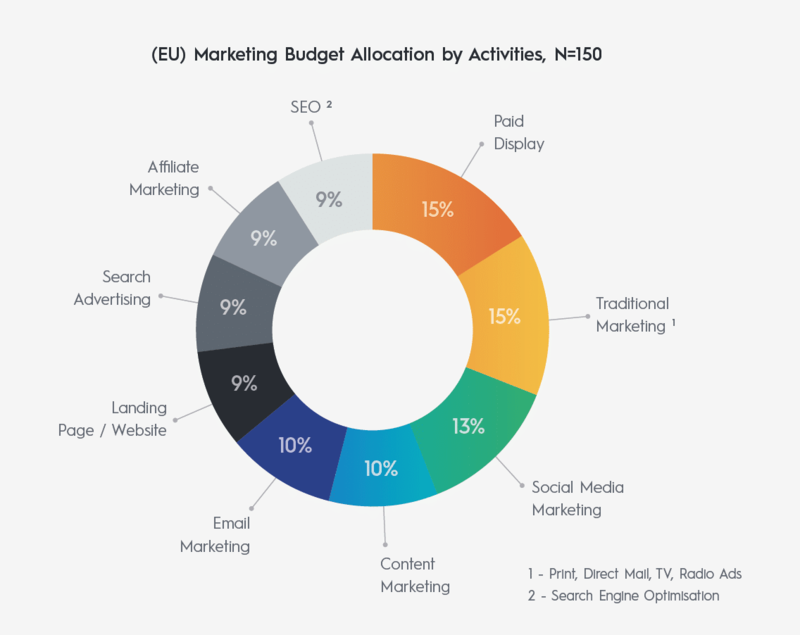 Traditional marketing took 15% of spend in 2017. Despite the overarching European trend, our data shows that in Germany, print advertising remains strong (though it is indeed declining), which could be a reflection of the country’s highly educated older population. As the second-oldest society in the world (with a median age of 46 years old), they may enjoy reading newspapers but remain skeptical of social media — especially if their peers aren’t using it. 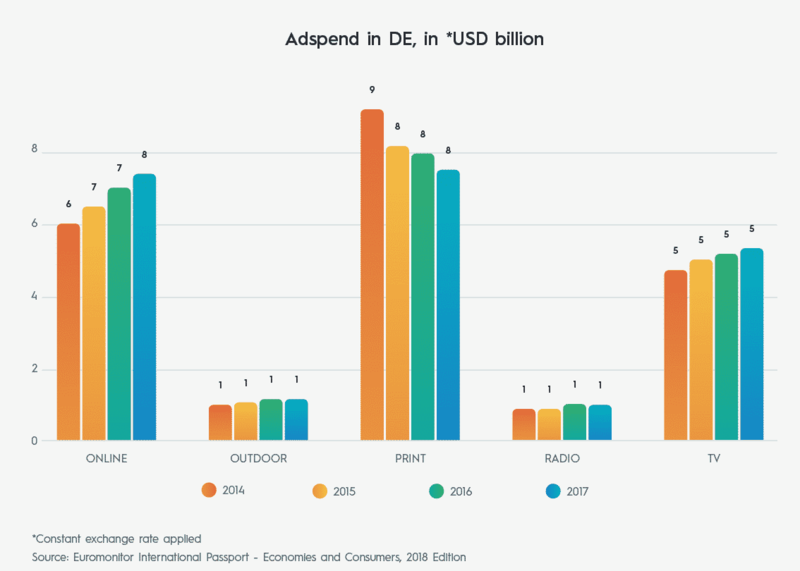 In any case, online ad spend is still increasing Germany, and was on par with print spend in 2017. Without being able to show what channels and tactics really move the needle, marketers aren’t able to secure the budget or stakeholder buy-in that they often need. When you have the proper tools and partners in place to measure data-driven attribution, you can rest assured that your marketing dollars are being well-spent. EU marketers say offering discounts and making ads graphically engaging are keys to app re-activation. For repeat purchase campaigns, EU marketers agree that motivating with compelling discounts — which could be delivered through great emails, social media, or in-app — is the number one tactic. Innovative formats – like interactive ads, videos, or even unexpected ad placements (advertising on the steps leading down to the metro rather than on or in the trains) and experiential marketing can help you target prospects at the optimal time and place and leave a lasting impression. Thinking outside the display-ad box will be key to winning more shoppers’ hearts and minds in 2019. Final thoughts on the German market: The climate is right for businesses to unleash their potential. In 2019, the most successful ecommerce companies will find even more ways to make the most of every opportunity, like building better mobile experiences and leveraging the traffic already visiting their websites. To learn more about how to deliver full-funnel ad experiences, download our State of Ad Tech Report today.